We’ve watched every VELO video we could find and spent a good hour, with several different hitters, in the cage with the Rawlings VELO. That data set, combined with our knowledge on performance baseball bats, prepped us to write this 2017 Rawlings VELO review. We aren’t the only ones to have information about the Velo. Other places, in particular those who sell bats, usually have a boiler plate write up on the specs of a bat. Many of those we reference to make sure we are seeing what we should be. Here are some more references for the 2017 Rawlings Velo review. We’d recommend the VELO to any player who prefers an aluminum barreled bat with its hot out of the wrapper functionality*. That player, we would also suggest, should appreciate a light swing weight per barrel size. The VELO receives near universal positive feedback on pop effect at different pitch speeds. At least as well as any bat on the market. As such, from little league to college ball the VELO is a very popular bat. Last year Rawlings labeled this particular bat the VELO Composite. We've yet to see that differentiation from vendors for the 2017 model. The only way to tell, aside from the serial number, is by looking closely at the picture. The two piece composite looks like, well, a two piece bat. In the 2017 class, there is yet to be a truly similar constructed bat. There are single piece aluminum bats, but none with a composite end cap. The most similar bat to the 2017 VELO is, without surprise, the 2016 VELO. Neither the standard VELO or the VELO composite are any significant amount different. The 2016 and 2017, we should note, are noticably different than the 2015 as the 2015 doesn’t have the extended composite end cap or the groove on the inner barrel as we discuss above. 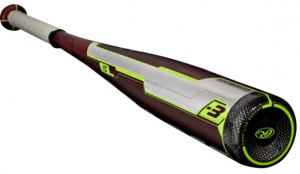 In previous years, Boombah’s Cannon bat is an attempted replica of the Rawlings VELO. It uses an extended composite end cap to lighten the swing of a mostly aluminum barreled bat. It may be easiest, if trying to grasp the breadth of the 2017 VELO line, to consider the bat in two general categories. In the main category sits the traditional VELO with its extended composite end cap and aluminum alloy frame. To these bats they’ve added the “HYBRID” tag on the barrel. This is technically true as it combines the aluminum and composite in the same bat. But don’t confuse it with the traditional hybrid setup in the baseball space which has a composite handle and full aluminum barrel. Save the two piece VELO Composite, the VELO is built with a full aluminum alloy body with an extended composite end cap. This cap, you’ll notice if you look closely, comes 2 to 3 inches into the barrel. An extended composite end cap drives the balance point toward the hands and gives the bat a lighter swing (lower MOI). The other feature in the VELO is on the inside of the barrel. If you were to cut it open, you’d find a groove within the barrel. Rawlings refers to this as pOp 2.0. The groove isn’t big enough to hurt durability, but it is, in large measure, how the VELO maintains its low swing weight despite being a mostly aluminum bat. These construction details, we should note, are the same as the 2016 VELO.